You Lin Xu, The Hong Kong Polytechnic University, China Prof. Y L Xu obtained his Doctorate from The University of Sydney, Australia, in 1991. Having worked at James Cook University, Australia, as a research fellow from 1991-95, he joined The Hong Kong Polytechnic University in 1995. He was promoted to Professor in 1999 and to Chair Professor in 2003. Prof. Xu has been the founding Director of Research Centre for Urban Hazards Mitigation of the University since 2002, and was appointed as Head of the Department of Civil and Structural Engineering of the University in 2007. Prof. Xu has conducted research and consultancy work in the field of wind engineering and bridge engineering for almost 30 years. He has worked extensively on wind loading and effect on the Tsing Ma suspension bridge in Hong Kong since 1995. 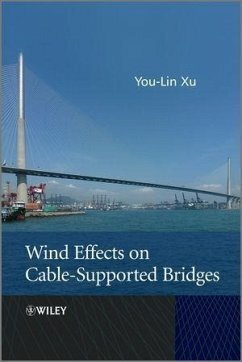 Prof. Xu has also been heavily involved in wind studies of the Stonecutters Bridge in Hong Kong. At The Hong Kong Polytechnic University, Prof. Xu has taught the subject "Wind Engineering" to MSc students since 1998. He has edited 5 books, published over 160 refereed international journal papers, and presented over 200 conference papers. Prof. Xu is a Fellow Member of the Hong Kong Institution of Engineers (HKIE) and a Fellow Member of the American Society of Civil Engineer (ASCE).